We gave a you a full preview of this 9.5m Cockwells custom tender in March 2012, and now it has become a reality with the successful completion of its sea trials. 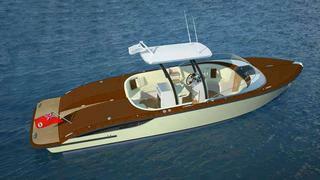 Designed by Andrew Wolstenholme and Cockwells, the retro-style tender has a lightweight composite hull, teak decking, a smoked glass custom windscreen and a folding bimini. Its generous cockpit accommodates up to 12 guests plus two crew members. And, powered by twin 315hp Yanmar 6LPA engines, this tender is capable of a top speed of 40 knots. When delivered, this Cockwells tender will become one of two tenders destined for the 73m explorer yacht Grace E, the third in the Vitruvius series (the first two being Exuma and Galileo G) currently under construction at Perini Navi’s Picchiotti yard in La Spezia, Italy, and scheduled to be launched this summer.